Think outside the box. Delight your friends and family by letting them choose their own delicious gift! Our farmers market gift coins work like a gift certificate, have no expiration date, and can be redeemed at any CUESA farmers market stand. They are conveniently pre-packaged in $25 boxes and $10 bags, but they are available in any amount. Market coins also make great corporate gifts. 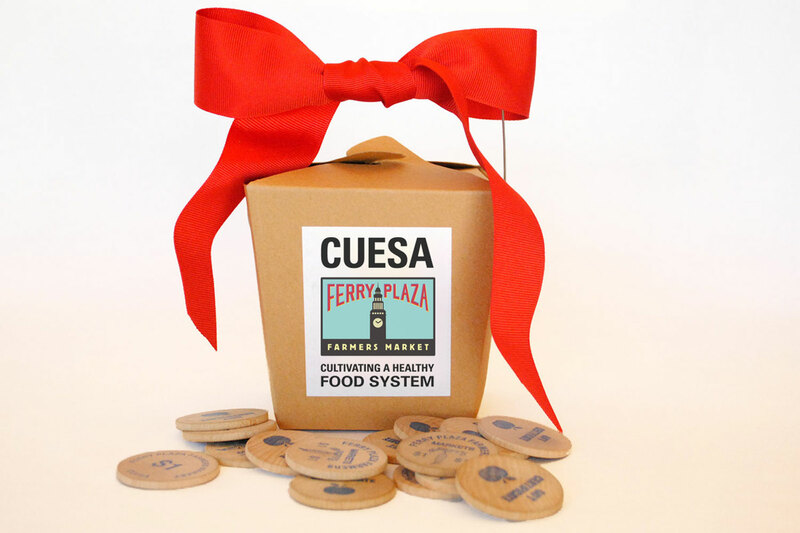 Purchase gift coins at the CUESA Info Booth, or order by emailing info@cuesa.org or calling 415.291.3276 x 103. All gift certificate wooden coins are in $1 denominations and can be redeemed at any outdoor stand at the Ferry Plaza Farmers Market. This universal money allows you to shop at the farm stands selling fresh produce and flowers, stalls selling prepared foods such as cheeses and breads, and outdoor restaurants selling ready-to-eat food. Wooden coins are redeemable only at the outdoor Ferry Plaza Farmers Market. The coins are not accepted by the private retail establishments inside the Ferry Building. There is no cash back available through this system. Your purchases will round up or down to a whole dollar—unless you have small change to make up the difference in the price of your purchase. If you have any questions, please call the office at 415-291-3276 x103 or speak with one of CUESA’s representatives at the CUESA Info Booth on a market day. As of April 1, 2017, all market coin purchases with Square at the Info Booth will be assessed a 2.75% service fee.